There are many ways in which blending machines can be filled with product to be blended. In multi-story buildings, it can be filled (also called charged) from the floor above. Blenders can be placed on a lifting mechanism that allows the product to be dumped into the blender from the top, then the blender can be lifted to allow the discharge out from the bottom. This system is especially valuable in buildings with low ceilings. The most popular method however is to have a mezzanine out in front of the blender and fill (or charge) the blender from there. 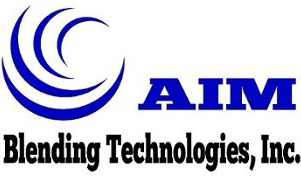 AIM Blending Technologies, your source for fluidizer selections and industrial blenders, builds many mezzanines for its customers. Sophisticated mezzanines can hold tons of material to be blended and an area for servicing the motor/gearbox and as well as a cleaning platform running all the way along the back of the blender for cleaning and inspection purposes. Our state-of-the-art mezzanines include safety gates for loading. They can have pneumatic lifting systems for lifting 50 or 100 pound bags from a pallet up and onto the edge of the blender. They can include bulk bag dumping rails or tracks for staging and dumping anywhere from one to a number of one-ton bulk bags at the same time. They can include magnets, sample ports, dust collection systems and bulk bag filling systems on the blender's discharge. AIM has produced and installed systems which allow the customer to run nearly twice as many batches per day as to what they had previously from a similar size blending line. Conversely, a budget mezzanine can be constructed to a minimum width just large enough to hold the materials going into the blender. It is true that very sophisticated mezzanines are not inexpensive. But when you compare this cost with the cost of a ribbon mixer or other blender, it is only a fraction of the expense and yet it can help the blender produce up to twice the blended product per day. AIM manufactures these mezzanines in large sections so they are easy to ship and reassemble at your plant. Even the more complex units, which include a new blender, can be assembled in approximately three days by a small crew of capable installers. We mark all of the joints so the installer knows exactly where and how to connect the parts and should it ever be needed, the system can be taken apart the same way and moved to a new building or location. Handling materials to and from a blender is one of the specialties of AIM Blending Technologies' design crew. Our designers have an average of over 25 years of experience as blending plant operators. One was recognized by large international companies for designs and concepts in material handling which are still in operation over twenty years later. He consults with our company on projects worldwide. Why not get that kind of expertise with your next project? You might think that it would be much less expensive to have a mezzanine built locally. But when it is constructed by the blender manufacturer, all of the finish work will be made to match. This really sets the blending system off as a show piece. The blender becomes an integral part of the mezzanine for maximum sanitation and maintenance ease. The assembly time at the customer's plant is a fraction of that of building a complete mezzanine locally and freight charges are minimal when shipped with the blender. Since AIM Blending Technologies, Inc. has built many mezzanines, we know just how to add the special features that our customers want and we get it right the first time. It takes a professional manufacturing plant and specialty equipment to accomplish this level of workmanship. Remember, AIM is all about giving you the most value for your investment dollar, so call our sales team today to discuss your needs, our designs, and what extra quality you can get with your investment dollar when you AIM for the best. AIM Blending Technologies, Inc. has produced showroom mezzanines and showroom blenders. These mezzanines help make a real superior statement to the customers who tour their plant. But equally as important to these companies is, the statement these mezzanines made to their own employees. Not only by the sanitary standards and safety equipment these mezzanines have, but by the speed and efficiency at which they operate at.